The Hockey Show, Canada's only campus-produced radio show that strictly talks hockey, is back tonight with a very special interview as I've been working to try and pin down a time on our guest's schedule for some time. While he'll deny it, he's a mover and shaker when it comes to doing great things in both the hockey world and the charitable world, and his intertwining of those two worlds are why Beans and I are honoured to welcome him to the show. This won't be your normal NHL Playoffs show - we may still get some chatter in - as tonight's guest is all about doing amazing things thanks to hockey! Beans and I are proud, honoured, privileged, and humbled to welcome Ryan Baillie, the Executive Director of Hockey Helps The Homeless, to The Hockey Show tonight as we learn about everything this amazing charitable group does in helping people in cities across Canada through hockey! We'll talk to Ryan about how he got started with Hockey Helps The Homeless, the work they do and why it's so important, how people like you can help out, and possibly a major announcement for the city of Winnipeg that Ryan may have. It should be a great chat about an incredible organization that does so much good work in the cities they're currently in, and we feel pretty lucky to have Ryan on the show tonight. Of course, we may have to grill him a little on the Toronto Maple Leafs getting bounced from the playoffs as Hockey Helps The Homeless is based north of Toronto, but I'm sure he can return the favour with a few zings about the Jets! All in all, we're excited to talk to Ryan tonight, and we hope you'll join us on 101.5 UMFM at 5:30pm CT! Speaking of joining us, the new UMFM website's online streaming player is pretty awesome. If you're using an Apple device, the player doesn't seem to like Safari yet, but we highly recommend you use the TuneIn app found on the App Store or perhaps another browser. If you do use the TuneIn app, you won't be disappointed. It's a solid app. Having lost faith in Facebook, I spend far less time on that site for good reasons. In saying that, you can still email all show questions and comments to hockeyshow@umfm.com! Tweet me anytime with questions you may have by hitting me up at @TeebzHBIC on Twitter! We're here to listen to you, so make your voice heard! 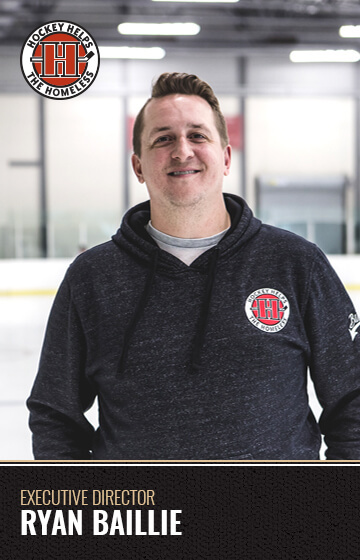 Tonight, Teebz and Beans chat with Ryan Baillie, Executive Director of Hockey Helps The Homeless, about his work, the work of the organization, some of their major achievements, the people they help, perhaps some news about Winnipeg(? ), and much more only on The Hockey Show found exclusively on 101.5 UMFM, on the UMFM app, on the UMFM.com web stream! RESOURCES: Hockey Helps The Homeless, Red Road Lodge, Willow Place, Resource Assistance for Youth (RAY). With the overtime finish in Washington tonight between the Hurricanes and Capitals, this got pushed back a little later than I originally had planned. Thankfully, we didn't need a six-overtime epic for this one, so I can post this with some time to go. 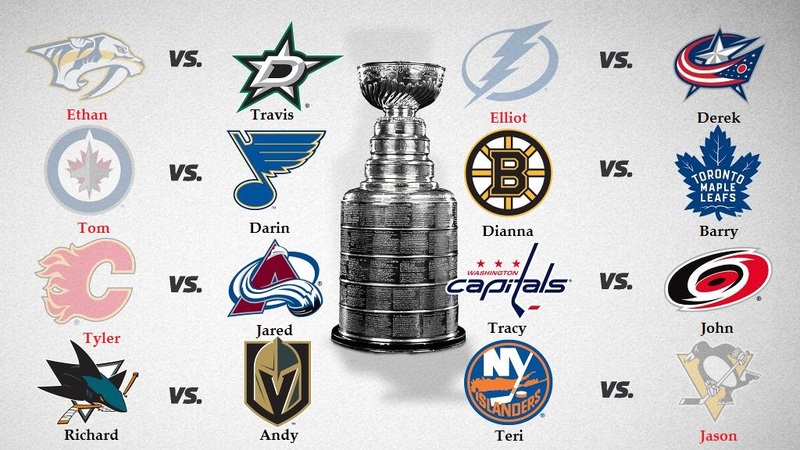 The second round of the Stanley Cup Playoffs starts tomorrow, so you'll need to get this one in quick. However, I realize that time zones and work hours and all the things that are a hundred times more important than this pool, so I'm gonna cut everyone a break as well. Read down to see what that break is and how it affects you. After all the craziness in these playoffs, I figure everyone deserves something to help them. First, the business side of the equation: here's the new spreadsheet for Round Two. Same rules as before - rename it with your name AND ADD "R2" AT THE END, and then send it to me at this email address. As you'll notice, there are no player selections for each division this time. Your scorers that you chose at the beginning are your scorers for the playoffs. No exceptions and no changes. Unfortunately, no one has more than two scorers remaining and a few people are already down to zero. The upsets in the first round really hurt the scoring threats that people assumed would go the distance. 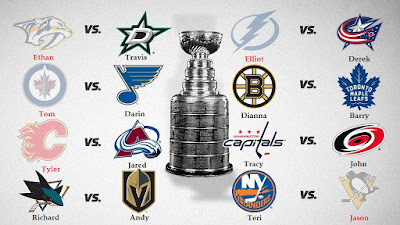 C'est la vie in the 2019 edition of the Stanley Cup Playoffs. As for the break I'm offering, I realize that time is of the essence when it comes to getting this spreadsheet in. So to alleviate any late entries, everyone in the pool gets the Boston-Columbus Game One result for free. That's right: a free point for simply getting the sheet in prior to the St. Louis-Dallas game. And please don't send in a sheet with the game-winning goal scorer for the Boston-Columbus game either - you're already getting that game gratis. There won't be any added points awarded. I can already hear some of you saying, "But Teebz, if everyone gets a point, that doesn't benefit me at all!" Well, yes, you're right. As Syndrome points out, there is no real benefit to this break other than making it as fair as possible for those people who have other things happening that may prevent them from getting the spreadsheet submitted before the Boston-Columbus game because there's less than 24 hours between the end of Round One and the start of Round Two. I'm not going to penalize people for having lives, so let's quiet down about this not benefitting people. It benefits all by being fair to everyone. Ok? Ok. Finally, the leaderboard will be updated some time on Thursday, so make sure you check in and see where you are in the standings. 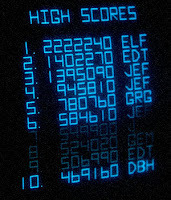 I will put the table back in to make the leaderboard pretty, but I simply didn't feel like coding the other day. Yes, I was lazy. Get your picks in ASAP, and let's get on with Round Two! Normally, when one sees this many sharks converging in one spot, one would assume there's a significant amount of chum in the area. 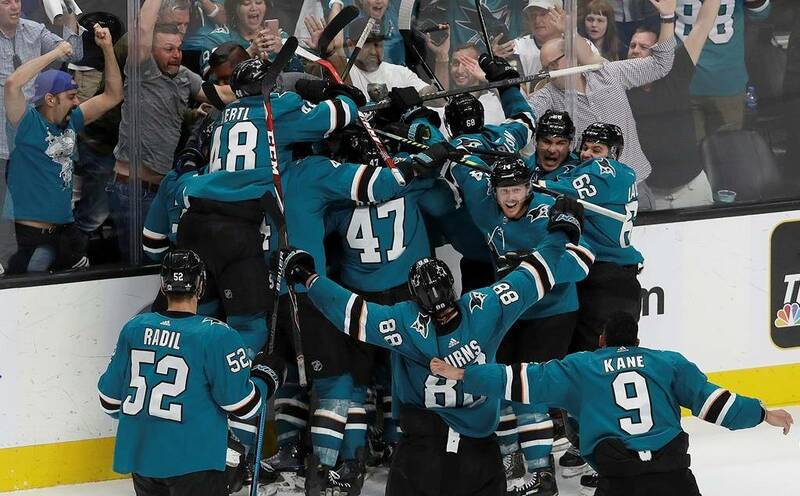 Instead, these Sharks had just finished their blood-in-the-water moment in the third period before taking the final bite out of the Vegas Golden Knights with a Barclay Goodrow overtime game-winner. People will point at the major penalty to Cody Eakin as the turning point as the Sharks scored four times to take a 4-3 lead in Game Seven, but Vegas had multiple chances to oust the Sharks and just couldn't deliver the death blow. We go to Game Five with the Golden Knights leading the series 3-1 after having taken three-straight games off the Sharks. Jonathan Marchessault scores at 11:36 to make cut the deficit to 3-2, but the Golden Knights give up a Tomas Hertl goal just 3:09 later to put San Jose up 4-2, and they'd ice the game with a Joe Pavelski goal at 18:14. Still two more chances, and the Golden Knights were heading home where they had won two-straight games. But following the game, this happened. Look, I like Hertl, but the Knights should have had his comment pasted all over every bulletin board, every window, every ticket booth, and anything else where it can be taped, pasted, or pinned because he's not Mark Messier. While I admire his courage, Tomas Hertl's comments should have rattled the helmets of the Vegas Golden Knights. With the game tied 1-1 and in double-overtime, Tomas Hertl - yes, that Hertl - fired a blast past Marc-Andre Fleury at 11:17 in the fifth period of play to give the Sharks the 2-1 win. What should be noted here is that Martin Jones made 58 saves in this game! Reilly Smith, Jonathan Marchessault, and Alex Tuch had 21 combined shots and had just one assist to show for their efforts. Martin Jones was magnificent in this game, but the Golden Knights have to find a way to dent twine more than once after throwing 59 pucks on net. If one wants to point to a moment in this series where Vegas missed a glorious opportunity, it likely was the overtime periods in Game Six. The Golden Knights needed just one goal through the 30 minutes of overtime play, but couldn't solve Jones on 15 shots through the overtime periods. The Knights carried the play in overtime, out-shot the Sharks, but simply couldn't convert. Entering the third period of tonight's game, the Knights once again held a 2-0 lead, and they increased the lead to 3-0 at 3:36 when Max Pacioretty found the back of net. The Knights were 16:24 from moving into the second round, but the cross-check by Eakin leading to Pavelski's injury and the subsequent five-minute major penalty was the opening that San Jose needed. But the Knights still should have controlled their own destiny. Four power-play goals in 4:01 later, and the Golden Knights looked dazed and confused as the Sharks had completely stolen the game from the jaws of what appeared to be Golden Knights victory. And as the night rolls on, the players and fans and experts will point to the call and exclaim how the referees made a grave error by making this call that determined this series. Pretty sure that Eakin's stick parallel to the ice and pushing Pavelski backwards would mean that the criteria in Rule 59.1 was met. If we jump to Rule 59.3, the severity of the cross-check and the associated penalty is at the discretion of the referee, and in seeing Pavelski lying motionless on the ice following his fall it seems the referee deemed the penalty worthy of a major penalty. Most penalties called in the NHL are at the referee's discretion, so can fans really be upset if the guy Eakin cross-checked is seriously injured and can't return? Let's be honest: Eakin's cross-check led to a series of unfortunate events for Pavelski that ended up with him being hurt, and the referee reacted with the severity of the penalty to the injury on the ice. With 59.3 now being assessed, that also activates Rule 59.5 which would see Eakin receive a game misconduct. That's how the rule book is written. Honestly, the five-minute major is a setback, but the Golden Knights were 4-for-4 while shorthanded in this game. The Sharks were 4-for-25 with the man-advantage prior to the major penalty, so whatever the Golden Knights were doing on their penalty kills, it was working. And then the ceiling caved in. Look, one can blame the officials for handing out that penalty. But the penalty kill of the Golden Knights fell apart in four minutes in Game Seven. And they still had chances to end the series in Games Five and Six. To point at one moment and exclaim, "That cost us the season," that's just patently false when there were many moments that the Golden Knights just couldn't kill the Sharks. If you have your foot on your opposition's throat, you better end them. Allowing them to get up off the mat and continue to fight usually results in bad things. That's exactly what the Golden Knights did, and now they'll gave all summer to ask how they missed so many opportunities to gut the Sharks after going up 3-1 in this series. As you may be aware if you tune into The Hockey Show, Canada's only campus-produced radio show that strictly talks hockey, Canada's Best Hockey Radio Contest™ is currently in the midst of the first round of the Stanley Cup Playoffs as the Survivor: NHL Playoffs contest continues to run on The Hockey Show on UMFM. 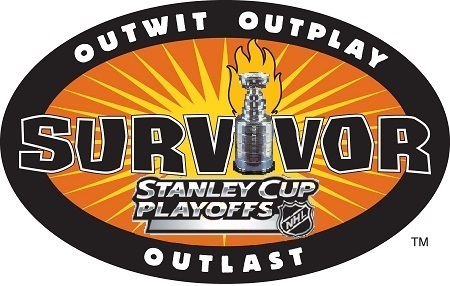 While we await a few series to conclude, I have been tardy in posting the who-versus-who image as the contest participants, so I figured that might be a good idea tonight with Nashville being voted off the island. Ladies and gentlemen, here is the Survivor board current after tonight's results that saw Dallas advance and Carolina force Game 7. If you click the image, you can make it bigger to see who is still in and who is on their way back from the island. 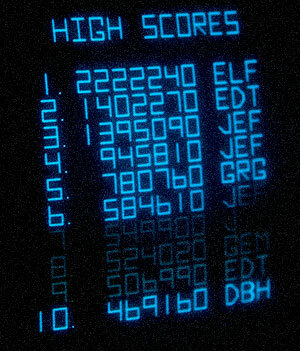 Names in black are still alive while names in red have been, unfortunately, eliminated from winning the grand prize and all the glory that comes with it as the faded logos are representative of the faded dreams of winning this contest. May 2 is when Beans and I will run through the first eight exit interviews for the teams dismissed in the opening round. That means that Elliot, Jason, Ethan, Tom, and Tyler will be joined by three other individuals on that day as we block off the May 2 episode of The Hockey Show for exit interviews. I'm already excited to hear what Jason and Elliot have to say after their teams were swept off the island, and I suspect that Tyler and Tom will have some thoughts on the Flames and Jets making very early exits compared to where people thought they may end their series. Nevertheless, it should be a fun show on May 2 if you want to hear some hockey fans rip into specific teams! As with any competition that keeps scores for people to check, the HBIC Playoff Pool also has itself a leaderboard where names and corresponding scores are posted. This is that page, so if you're in the pool you may want to bookmark this page as it will be updated at the conclusion of every round with the new scores. I have to admit that in scoring the pool entries so far, there are some impressive totals in the first round of play, and then there are some people who are at the bottom of the scoring list because they didn't follow the instructions very well. I can't fix that, so those who find themselves at the bottom of the scoring table should have paid attention a little more closely. The leaderboard is posted alphabetically by first name with last initial for clarity, although this appears to be the first time in the pool's history that we don't have same names for any of the entrants. Next to the name is the team each person chose for the tie-breaker. Following that, the number listed is how many of the four players each person picked to help their scoring have left in the playoffs. As you can see, until the scoring is posted, everyone is still showing four scorers except those who decided that they didn't want any help. That's on those two entrants as they'll be forced to win this thing with predictions alone. With a handful of series to be decided, there likely will still be movement in the scoring, so make sure you check back midweek for the new pool spreadsheet and the the updated scoring totals! You're reading that correctly in that just 16 people have entered the pool. That means that this year's pool has the best odds of any of the names above winning, and it helps me immensely because I don't have to spend hours marking pool entries. My complaining aside, all entrants have a 1-in-16shot at winning the pool right now and the great prizes at the end! What are the prizes, you ask? Those will be revealed at a later date, but I assure you that the top prize is an NHL jersey. That won't change from previous years. I'm still waiting on a couple of places to ante up for the contest, so all shall be revealed shortly. 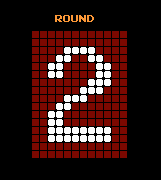 Make sure you check back here to see your point totals once all the Round One series are done, and then head to the summary page to get the next spreadsheet for Round Two!